What foods should you bring camping? This seems to be a common question among campers, so I figured that I’d write an article about it. The truth is, there’s no universal camping food list to follow. I will, however, give you my thoughts on the matter. That way, you’ll know exactly what foods and beverages to buy for your camping trip. Not only will we talk about camping food ideas, but we’ll also cover the various ways to transport, pack, and protect your food from the elements. Let’s get started. 2 Don’t Know What to Bring? Then Make a Plan! 7 Don’t Forget Utensils and Cooking Ware! Finally, you want to think about portability. Even if a food is non-perishable and filling, it still won’t be worth bringing if it’s big and bulky. Focus on foods that take up minimal space. Make it your goal to pack a ton of calories into a relatively small space (I talked about this principle in an earlier article). This is why you often see hikers bringing trail mix and granola bars with them- because they’re full of energy and don’t take up a lot of space. Don’t Know What to Bring? Then Make a Plan! What is the temperature going to be like? How many people are going? Are they bringing their own food? Does the food come pre-cooked? If not, do you have the tools to cook it? Do you know how to properly dispose of food waste? Did you think about things like utensils, plates, or cooking ware? The length of your trip will play a big role in helping you determine how much food you bring. Obviously, you’ll need a heck of a lot more food for a 7-day camping trip versus a 2-day camping trip. Also, think about weather. If it’s exceptionally hot (like in the desert), then the quality of certain foods can become compromised. These are a few great questions to ask yourself when putting together a camping food list. By no means is this a “complete” list. I simply wanted to give you an idea as to what can be in your camping food list. As you can see, most of these foods don’t rely on refrigeration to stay fresh. This is very important, especially if you’re going on a multi-day camping trip. Finally, for hydration, don’t forget to bring bottled water or sports drinks! One of my favorite breakfast camping food ideas is whole fat powdered milk. Specifically, I recommend Nestle Nido. This particular canister offers 140 calories/ounce, and tastes amazing. You can usually find it in Hispanic markets, but I usually order mine from Amazon. You can even mix in your own chocolate for added taste. Another great option is whole grain cereal. Mixed with the whole fat powdered milk, it’s a great way to start your morning in the wilderness. I like to bring a box of Kashi 7 Whole Grain Puffs Cereal on all my longer camping trips. Not only does it contain 0 grams of sugar, but it also tastes great. You can probably find this cereal at your local Whole Foods. Finally, don’t forget to put coffee on your camping food list. It’s great for when you need an energy boost in the morning. One of the more popular lunch camping food ideas, especially among kids, is peanut butter and jelly. It’s not recommended for longer camping trips, but for shorter ones, it’s perfect. Just 2 tablespoons of peanut butter contain a whopping 188 calories. That’s a lot of energy, and will help keep you going in whatever you’re doing on your camping adventure. Another good lunch option is crackers and tuna. Tuna contains a lot of protein, so it’s a great way to get energy. Just make sure you bring a can opener! You’d be surprised by the number of people who bring canned food with them camping, but forget the can opener. Finally, bring some beef jerky. Most people consider it a snack, but there’s no reason why you can’t have it for lunch. Note, to save money, you can dehydrate your own beef at home. As far as dinner camping food ideas are concerned, a good option is rice and beans. Beans offer a lot of protein, while rice offers a lot of carbohydrates. Also, don’t forget your eating utensils and plates/bowls. This is the perfect food combination in my opinion. Not only does it taste great, but it’s also nutritionally dense and easy to make. When putting together your camping food list, be careful about stocking up on too many canned foods. First of all, canned foods don’t offer that much caloric density per unit. Secondly, once you’re finished, you’ll be left with an empty can, which you’ll have to carry back out. I’m not against canned food, but I am against bringing too much of it. Don’t Forget Utensils and Cooking Ware! When putting together your camping food list, know that the metal pot actually serves a dual survival purpose. 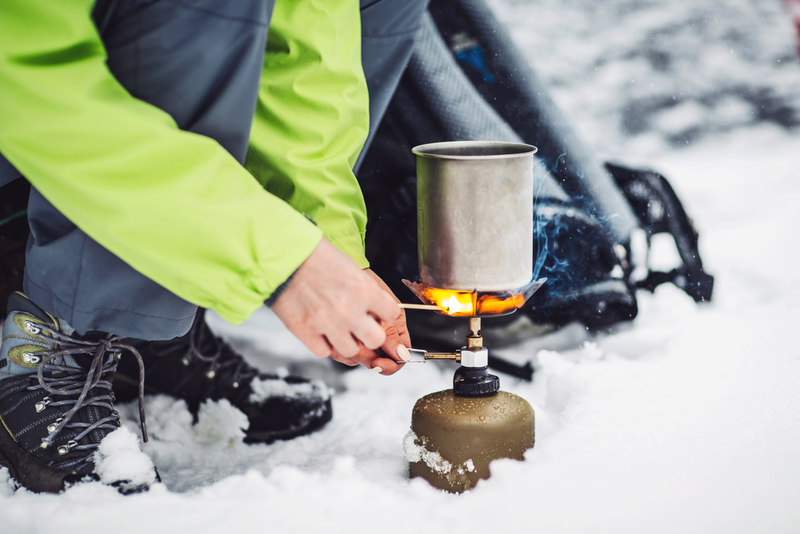 In the event that you get lost, you can use a metal pot to collect and boil water. This is just something to think about when planning your camping trip. Also, if you think that you’re going to have leftovers, bring Tupperware. When putting together a camping food list, there’s no “exact” amount of food you should bring. It depends on a lot of factors- the length of your trip, how much you’ll be exerting yourself, etc. In general, the more physical activity you do, the more food you’ll need. So if you’re planning on doing a ton of hiking/climbing while on your camping trip, then you’ll need a lot more food. But exactly how much is “a lot more”? Let’s take a math-based approach (bear with me): in order to maintain the same weight, a 165-pound male hiking 8 miles per day would need about 4,000 calories per day. This is a rough estimate, and shouldn’t be taken too seriously. After all, you know your body better than anyone else. If you’re not planning on doing too much physical activity, then you you’ll probably need only 2,000 to 3,000 calories per day. The Coleman Butane Instastart Stove is my recommended option as far as camping stoves are concerned. The reason why is because of how affordable it is. At just $20, it won’t break the bank. If you have things on your camping food list that require heating, then a portable camping stove might be a good investment. To use it, simply insert the butane cylinder, turn on, and cook like you normally would on a regular stove. Note, if your camping trip is going to be longer than a few days, you’ll want to stock up on several butane cylinders. Chili: For some people, there’s nothing more delicious than a big pot of chili. Here’s a video on how to make it. Chili is so easy to make that anyone can do it (plus, kids to love it). Hot Dogs: Of all the foods on this list, hot dogs are arguably the easiest to make. The best part? You can buy a lot of them for cheap. Here’s a video on how to cook them. Pancakes: Just because you’re in the wild, doesn’t mean you can’t chow down on delicious breakfast food. Check out this video of a fellow camper cooking some delicious-looking cast iron pancakes. S’mores: No camping food list would be complete without mentioning S’mores. You’re going to need graham crackers, marshmallows, and chocolate. Here’s a video on how to make them. Broiled Fish: For all you fish lovers, consider cooking some broiled fish. Fish is super-healthy and is an excellent camping food. Here’s a video that will teach you how to do it the right way. In summary, you want to buy foods that aren’t going to go bad. Things like peanut butter, protein bars, and crackers are all great examples. Beef jerky and trail mix are also great options. You also want something that has a high calorie-to-weight ratio. For example, a single cup of almonds contains about 530 calories, whereas a cup of potato chips contains about a third of that. We hope that this camping food list gave you a better idea of what foods to bring on your next camping trip. Thanks for reading.